You are here: Home / Accepting Death / Alone in grief forever? Grief affects people differently and no ones journey or experience can ever be the same as anybody else’s. Some parts can be similar though and knowing somebody else’s story can sometimes bring comfort and reassurance. This is a personal reflection by Marian, Gumby’s ma, just 18 months after losing her mother, husband and precious baby boy within months of each other…. A little while ago, it happened. 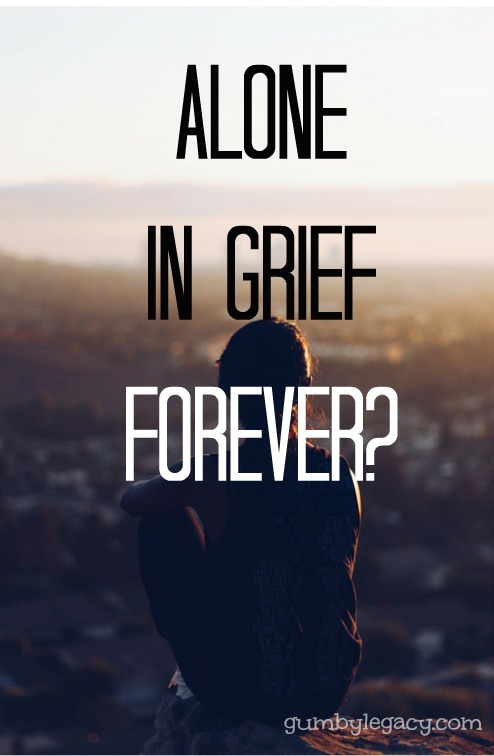 I suddenly realised I was going to be alone in my grief forever. Not because there is no one to grieve with me, alongside me, or to grieve for those I have lost but just because I alone, as are all those who have lost someone they loved or thought they would have liked to have known better, know, realise and understand what it is that they alone have lost. Smiles, right words and appearances are all easy to put on when it seems they are needed or expected of those grieving, by those around them. The fact is, only you have that gaping hole in your life. That sense of loss, that overwhelming love and all the memories that accompany your every waking, and often sleeping, moment. But, for your sake, the sake of those you’ve lost and of all who care for you and that you love and care for, you need to be alright, whatever alright is. You need to be able to laugh, joke, enjoy all those little things that have made your life special whilst you weren’t ‘alone’ and try to focus on the good things that have and are still happening. And then, when you need to, with those that love and understand, or by yourself, not be alright. Keening, if that is what you need to do, letting your emotions overtake you to help you through that moment. Until we lost Jeremy, I never understood ‘keening’. Suddenly it was something that was so spontaneous, exact, and necessary, that the word and the feeling and action made sense. More recently I have begun to understand what a blessing it is that those who play an important part of your life, in work or play, understand or at least give compassion to you in a way that initially, you somehow almost feel that you don’t deserve.